They've been called the most successful husband and wife comedy team in history, and you'll find no dissension in these ranks. 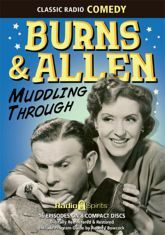 George Burns and Gracie Allen had a chemistry and wit about them that had no parallel. In this sampling of programs from the 1940s, George and Gracie face new livelihoods (and livestock), mad undertakings (and misunderstandings). They budget and blunder alongside Bill Goodwin, Meredith Willson, Mel Blanc�and special guest Jack Benny. Let Gracie make you giggle through sixteen digitally restored and remastered broadcasts.